7-16-14 -Today I’m returning to Dr. Gent’s office for my 5-day post surgical check and a PRP (Platelet Rich Plasma) Injection after he performed my Arthrex TightRope Dynamic Stabilization of my distal tibiofibular (tib-fib) joint on my left high ankle. See prior blog for the surgery details. I was very pleasingly surprised at how well my ankle looked. A very minimally invasive surgery with only a few stitches. I had complete satisfaction with my prior right ankle Arthrex surgery that gave me stability along with full ROM and function; hence, I am expecting the same now from my left ankle. Julian Henslee, a Clinical Solutions Representative. from ABI Extracorporeal Autologous BioSolutions Company in Seattle came to Dr. Gent’s office to draw my blood and prepare the injection for Dr. Gent. Here is a PRP Injection Research PDF titled: “Autologous Platelet Concentrate for the Production of Platelet Gel” provided to me by Mr. Henslee. Here is a 3 part video series discussing the PRP Injection. The first two are with Mr. Henslee demonstrating and discussing the PRP Injection process in preparation for Dr. Gent to administer the injections into my ankle ligaments. Now that the injection has been prepared, Dr. Gent will discuss for a few moments what he intends to do. Before the PRP injections, Dr. Gent had used a numbing spray and then a Lidocaine prep injection after he marked the ligament spots by ultrasound guidance. I couldn’t video the actual injection because I really am a chicken when it comes to needles. I cannot watch whatsoever. 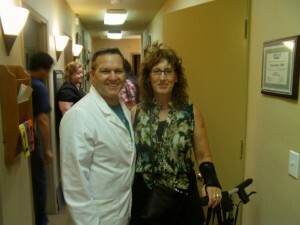 Marisa, Dr. Gent’s assistant, held my hand and I was really surprised that I didn’t feel hardly anything. I can only say that there must be more space in ankle ligaments because my experience with a prior elbow PRP injection gave me horrible pressure and spasms and sent me screaming. I’m so glad Dr. Gent didn’t have me screaming this time around. Dr. Gent re-splinted my leg and encouraged me to hang in there with the non-weight bearing for 5 more weeks. The splinting was to keep the ankle neutral and allow some healing to the ligaments. The stitches will be taken out by my local sports doctor. Dr. Gent said that he was available anytime should I need to call him and for me to keep him advised of my progress. Saying goodbye is never easy for me. We left after that appointment to travel 7 hours back to Lewiston, ID. Even though I was off the pain medication, I did take some this day for the travel which helped and when I arrived I elevated my leg for several hours that night. The next morning I did have more swelling than before the injections. It is normal to have swelling and some bruising. My patient to patient advice: For the unfamiliar reader, here is a Platelet-Rich-Plasma-Injections PDF from the Hunterdon Orthopedic Institute discussing general protocols for these injections and here is another orthopedic link: www.prpinjection.com I encourage patients to read all they can about these injections. 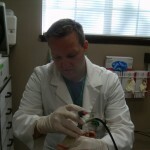 For Spokane patients, here is a link to my PRP provider Dr. Janes:http://www.prolotherapyspokane.com/ For the Olympic Peninsula, see my preferred provider, Dr. Gent, DPM, Board Certified Foot and Ankle Surgeon at Kitsap Foot and Ankle Clinic, Bremerton, WA for PRP Injections. My next blog will continue my story as I recover and how I make the most of the non-weight bearing status. Stay tuned! And now my website is on this Facebook.com link. Feel free to comment.